Vail will open more terrain in its Back Bowls on Thursday, the ski company announced on Tuesday, just in time for a significant winter storm to arrive on Friday. 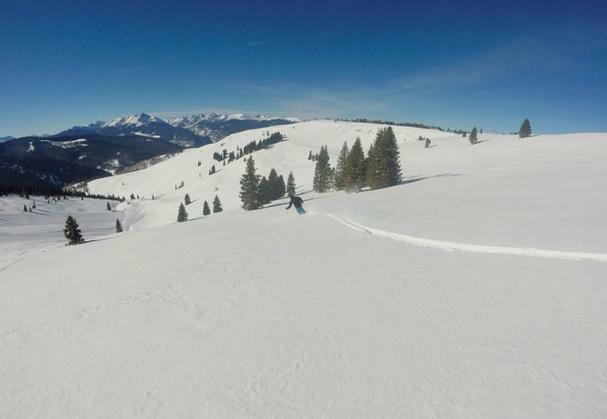 China Bowl opens on Thursday (Vail Resorts photo). Parts of China Bowl and Blue Sky Basin will open on Thursday, and the annual Snow Daze free concert series kicks off with major headliner acts on Friday and Saturday nights in Vail Village. Bonfire Dub opens up for Big Head Todd and the Monsters Friday night at Solaris, and Nick Bluhm and the Gramblers opens up for JJ Grey & Mofro on Saturday night at Solaris. All the shows are free of charge. With winter in full force and snow in the forecast for the upcoming weekend, Vail Mountain will open portions of China Bowl and Blue Sky Basin to the public on Thursday, boosting the open acreage to 3,078. Vail’s celebration of the 2015-2016 ski and snowboard season will continue into the weekend with its annual Vail Snow Daze on Dec. 11-13. In China Bowl, the resort will open terrain accessible from Two Elk and the top of the Orient Express Lift (#21), including the area from Poppyfields West to Shangri-La. Terrain open in Blue Sky Basin will include Champagne Glade in Earl’s Bowl to Iron Mask in Pete’s Bowl, and Grand Review to Resolution in Pete’s Bowl. Access for skiers and snowboarders headed to Blue Sky Basin will be available through the China Bowl gates at Two Elk and via Sleepytime Road from Sun Up Bowl through Tea Cup Bowl. The Orient Express Lift (#21), the Tea Cup Express (#36), the Skyline Express (#37), and the Pete’s Express (#39) will all be open. Vail is continuing its celebration of the start of winter with snow, après, and free concerts at Vail Snow Daze from Dec. 11-13. After a day spent exploring the mountain, visit the sponsor expo village and demo the latest gear, après at parties throughout the village, and wrap up the night with free live concerts. Bonfire Dub joins Big Head Todd and the Monsters to perform a free show on Friday, Dec. 11 presented by Pepsi. Nicki Bluhm and The Gramblers will open for JJ Grey & Mofro at a free concert on Saturday, Dec. 12 presented by Bud Light. Information is available at www.vail.com/snowdaze. Bud Light Aprés Party at Vendetta’s, Vail Village, 4-6 p.m. Vendor Expo Village, Base of Gondola One in Vail Village, 8:30 a.m.-3:30 p.m.
Live music and $5 Bud and Bud Light Drafts from 3-6 p.m.
$3 Bud Light Bottles from 3-6 p.m. Bud Light Aprés Party at Pazzo’s, Vail Village, 4-6 p.m. Bud Light Aprés Party at Red Lion, Vail Village, 4-6 p.m.
Solaris in Vail Village: Doors at 5:30 p.m. and show at 6 p.m.